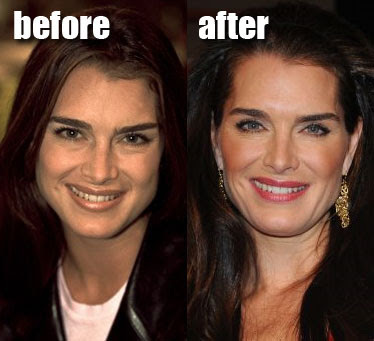 Brooke Shields before and after plastic surgery, nose job? Brooke Shields is a successful longtime American actress, featured in the television series Suddenly Susan, and also starred in the movie The Blue Lagoon. The actress seems to be aging quite nicely while in her mid forties, but then again most people look rather dazzling while donning a boutique worth of makeup, or perhaps Ms. Shields has also had some help from plastic surgery? While the idea of plastic surgery is kinda a toss up at this point, other gossip blogs have suggested that Ms. Shields has already surgically altered her face, after undergoing a nose job, cheek and chin implants. And from the looks of the before and after picture, the nose job procedure seems to be the only rumored operation that holds any water, as the bridge and tip of her nose does in fact appear slightly trimmed down. "I tried Botox in my forehead, I got so claustrophobic. I would get claustrophobia if I had breast implants. I'd be like, "Get them out, get them out." My husband's very upset about that though. "It's a very foreign, man-made object in your body... I'm also attached to my face. It's been around in the public eye for so long." "I don't know how I'm going to feel in 10 years you know, when my face is down by my knees. I mean you know, who knows? I'll just be wearing a lot of ponytails." "I want laser treatment because I'm not a fan of my wrinkles, but I have to find someone with a light touch. I’m scared I'll end up looking like the Joker." With all that being said, i think Ms. Shields has a prominently chiseled facial structure, and she properly wont have to worry to much about having a saggy or droopy face, but then again wrinkles are a whole different story, as you know. 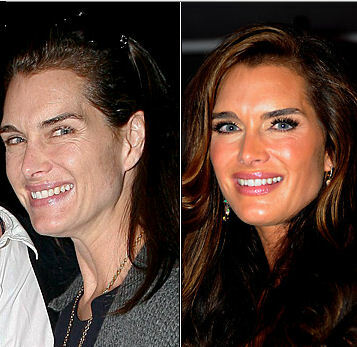 What do you think about Brooke Shields' rumored plastic surgery procedures, such as cheek and chin implants, plus the nose job? Are those claims nothing more than hot humid air? she was so pretty in blue lagoon ,what happend to her ,it's really amazing how she has changend !!!! Of course she has changed since Blue Lagoon! She was fourteen then!!! Who doesnt change?? Her nose is out of proportionately small to her other facial features. She looks like a Michael Jackson freak now. this is ridiculous. she clearly had and has perfect features and has had no surgical work. I think she still looks pretty. When she was young she was softer looking and now older has a slightly mannish appearance though as I recall her mother did too. But...I do think she "might" have had lower eye lid surgery several years ago to depuff that area which will almost always guarantee more wrinkles around the eyes. I say maybe, because it isn't obvious but her nose, she should have left alone, it was already a cute one and then she made her face look harder by "refining" it.